Active pa po ba to? active pa po ba ito ? may cp number po ba kau? Gusto q pong mgtip sa inyo about drugs kxo wla po telephone dto xmen..i need smart no. Pra mktwag aq xa precint nyo.. Slamat po. This is Lohraine’s messages sent to me. First message contained a dirty video that has been deleted by Facebook. 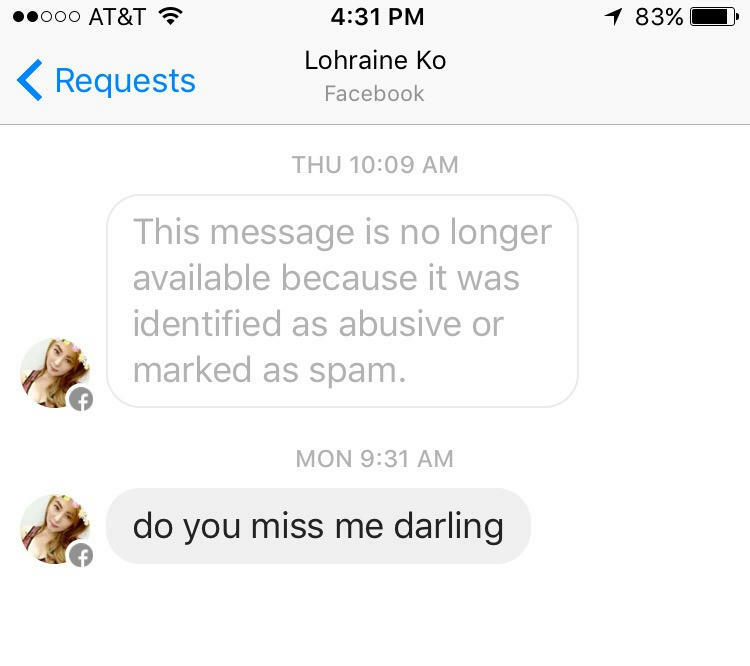 Second message says “do you miss me darling”. There is a group of criminal using dirty video to blackmail male persons. I am one of the victims. They also can smuggle drugs. Please arrest them and delete those video on their phone and other devices. A girl in this gang is Lohraine Ko (https://www.facebook.com/lohraine.ko.5) used fake name on facebook Jennifer Sy LEe to make friends and video called her friends on Viber with the above number. She went naked, trying to capture the image of the person she was talking to, then made a dirty video. Julius Adarne used this video to blackmail the victim. 2732 R. Fernandez st. Gagalangin tondo manila. Ask ko lang di ba. Bawal n ung mgsugal sa lbas. Lalo n kung nkharang sa daanan. Nkkaerwisyo.. Hindi mga magsitabe. At mga maiingay pa..
Manila barangay 129 zone 11 guidote street corner pinoy street balut tondo…residents mostly male…very loud videoke and drinking session on the street until the wee hours….barangay officials no action……same group on other days would block the street by playing basketball…..drug use may be involved because these informal settlers would threaten those who would call their attention for being the cause of noise pollution, obstruction and bad example to other youth residents. Hi! Hope this site still active. I just want to report that many youth ranges from 16-25 here in our barangay are publicly taking marijuana on the sidewalks and making noises in the middle of the night. Everytime we pass on the streets from work we can smell the air that comes from them and surely it is definitely the smell of marijuana. I hope you can take action regarding these matters. We just want a secure place where me and my family can walk safely specially at night. The area where they can ba located is usually along franco st and amarlanhagui. Please do make some action! And don’t rely on our barangay ’cause they’re unstoppable. Your response is highly appreciated. Emergency, my friend needs help , any globe contact numbers pls! Residential pala ito. Kahiya sa natawagan. . .
where to connect if it is measure of a person liable to crime. How can I file a complaint against someone in the phillipines? This page may not be monitored by the Commander & Police Officers of MANILA POLICE STATION 1 – RAXABAGO, thus they cannot respond immediately to your comment or inquiry. If you have an urgent concern, communicating with them directly through their contact number(s) or email is advised.